The Venue Report is a fantastic resource for couples seeking an out-of-the-box location to host their wedding. From five-star farmhouses to posh private estates and radiant restorations to inspiring openings, here are some unique event spaces to choose from for your big day. 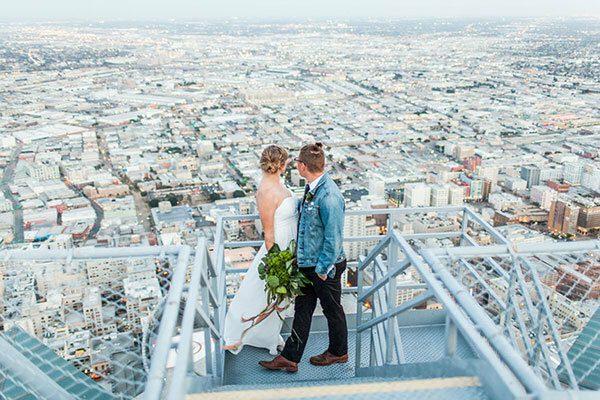 Check your fear of heights at the door, folks, because a wedding isn't a party until it's 1,000 feet above the sidewalk! As California’s tallest open-air observation deck, OUE Skyspace offers a sleek, modern space with breathtaking 360-degree views of the L.A. skyline. It's in the process of moving from the 71st floor to its brand-new home on the 70th floor, and brides can expect a variety of new features, as well as space for over 500 guests. Warehouse XI is a blank slate for some serious wedding style. Brides can expect a modern warehouse boasting white painted brick walls, black concrete floors and oversized glass windows for a warm, industrial feel. With over 2,000 square feet, let your imagination be your guide and gussy up this space with whatever your heart (or your Pinterest board) desires! Host your dream wedding at one of New York's most highly coveted architectural gems. The Beekman is an extraordinary 19th-century landmark building that's being converted into a new luxury lifestyle hotel in Lower Manhattan's "new downtown." It will feature stunning turn-of-the-century architectural details, set against four unique private event spaces that can accommodate 100 guests for a seated dinner and up to 300 reception-style. James Beard award-winning chef Tom Colicchio will provide the catering. The Chicago Athletic Association Hotel is an 1890s landmark that has sprung back to life as one of the hottest historic Chicago hotels of the decade. The iconic property includes a gorgeous gothic ballroom overlooking Millenium Park and Lake Michigan. They have a party-planning expert for just about everything from the planning to food; a “spirits” consultant will even help you create one-of-a-kind cocktails! The magic begins where the tracks end at Terminus 330, a historic building in the heart of Atlanta. It's recently transformed into two industrial-chic gathering spaces: One is open and airy while the other is intimate with vintage '20s flair. Both offer the perfect blank canvas for your wedding. One of downtown Lexington’s most spectacular new venues, The Apiary transports wedding guests into a hidden world that blends Southern hospitality with Old-World craftsmanship. Nestled behind historic brick walls crawling with ivy, this distinctly urban space is simultaneously grand and intimate, making Apiary the perfect choice for an elegant wedding in the cultural hub that is the city of Lexington. It boasts an on-site garden and a team of culinary masterminds, ensuring a feast for guests' taste buds and eyes. Another rustic trend for weddings is converted schoolhouses, and this venue is one of the prettiest we’ve seen. Imagine tying the knot in a beautifully renovated schoolhouse with over 10,000 pieces of gorgeous vintage china and hazelnut orchards and vineyards on the grounds. The “Museum as Retail Space” Gallery (MaRS) is a contemporary art gallery located on the East bank of the Los Angeles River, built in 1923 as an alcohol bottling and distillery plant pre-Prohibition. Renovated in April 2015, it now features five distinct gathering spaces and a succulent garden. Fun fact: The lighting was engineered to optimize moonlight, making it perfect for nighttime nuptials. The finest of Florida may very well be in Ft. Worth, where the funky and fun Social House just opened its designer doors. Run by an eclectic group of creatives, the sophisticated bar/restaurant can accommodate up to 200 of your nearest and dearest. It includes beautiful floor-to-ceiling windows, skylights, and glass doors, adding to the overall indoor/outdoor feel, accented by clean and chic décor. While we’re all for keeping Austin weird, a brand-spanking new boutique hotel is also dedicated to keeping it beautifully bespoke. South Congress Hotel boasts a sushi bar helmed by James Beard and Top Chef winner Chef Paul Qui, an onsite motorcycle repair shop, a beauty salon, fresh juice and coffee bar, as well as an onsite-all-night diner. It’s like they thought of everything! The quirky space also includes landscaped courtyards and gardens. Rustic weddings have been trending for the past few years, but radiantly restored spots like Overlook Barn give us a whole new reason to fall in love with them all over again. This whitewashed barn features a panoramic view of North Carolina’s gorgeous Beech Mountain and 30-foot arched ceilings with exposed wooden beams. Tucked amongst the rolling hills, apple orchards, and green pastures of the Columbia River Gorge in the Pacific Northwest is Tin Roof Barn. At over 100 years old, it's maintained its turn-of-the-century authenticity and charm while recently undergoing some modern updates. If you're searching for vintage romance with a dash of rustic elegance for your big day, you've found it. The White Sparrow is one of the most breathtaking vintage barns for weddings, hands down. It's nestled in a field surrounded by flower gardens, and it even features a sweet swing. Both the interior and the exterior are painted bright white, making it the ideal canvas for any color palette. Contrasting dark wood feasting tables play nicely against the all-white interiors, as do lots of greenery or pretty magentas or maroons. Delicate chandeliers make this space feel large, inspired and utterly feminine. For more than 50 years, Tate Farms has functioned as a horse and cattle ranch, and now, this beautifully rustic venue located just a half-hour outside of Dallas is officially hosting weddings. The 3,400-square-foot barn was built by hand by the Tate family with re-purposed wood and metal and topped with their signature piece: a vintage wagon wheel chandelier. Prospect House is one of the most exciting venue openings of the year, and you can expect greatness from the Texas Hill Country architectural marvel. Striking modern architecture is set against a native, Texas landscape, creating a beautiful contrast that makes for stunning wedding photos. Another major perk is that the rental fee includes ceremony and lounge furniture, in addition to standard seating. Boasting one of the most beautiful outdoor courtyards in the City of Angels, Plant Food and Wine will inject all kinds of California cool into your intimate "I do's." Brides can expect seasonally spectacular menus and a curated wine list. The setting is equally idyllic with French oak floors and a canopy of fig and olive trees; plus, it's just blocks away from the beach. Set in the heart of historic downtown Raleigh and only a few doors away from the Governor’s Mansion, this 1800s home has recently been restored to its original grandeur. It's the ideal place to host a fabulous Art Deco-inspired affair that would even make Gatsby himself jealous. It’s not often we come across a splashy "new" venue that dates back to before the American Revolution. Whitehall, a National Historic Landmark hotspot, just started to accept a limited number of events this year, so brides-to-be, book your date ASAP! This stunning venue boasts over 100 acres of the Chesapeake Bay shoreline, sweeping gardens, parks, historical architecture, and museum-quality artwork for supremely unique photo opportunities. This venue has been popping up all over Instagram — and with good reason! Silver Oaks Chateau is a beautiful French Provincial-style estate located right outside of St. Louis that's designed to make grand affairs feel intimate. With its Old-World charm and French country manor feel, it's the ideal setting for a classic wedding. Offering a bridal suite complete with vanity stations and privacy, a Grand Hall set with iron accents and spectacular views, and an outdoor patio that overlooks the Oak Woodland Prairie and Oak Forest Reserve, it offers all the princess-worthy details you crave for your big day. The Hasbrouck House's historic property features a beautiful collection of suites in an upstate New York setting. More reasons to celebrate? This beautiful property will host a limited number of weddings per year. Also, weddings are managed by the team from sister wedding venues The Green Building and 501 Union in Brooklyn, NY. Celebrations will take place on the main lawn, which can accommodate up to 150 for ceremony, cocktail, dinner and dancing. Hasbrouck House will provide in-house catering and venue coordination for a smooth and seamless experience. One of our favorite small boutique hotel brands, 21c leads with art and heart. In fact, they select their hotel spaces around the specific art they want to showcase. Bonus: You don't need much additional décor with a venue space this beautiful! Special touches include beveled windows and a vault where you can host your welcome dinner party. The Main Gallery seats up to 250, so you can be sure your dose of culture is coupled with Southern hospitality. This historic and intimate 18th-century manor house re-opened at the end of summer after a painstakingly intricate restoration. It boasts sumptuous, elegant interiors with over 5,000 square feet of party-perfect possibilities, including a chandeliered ballroom, wrap-around porches for cocktail hour, and manicured grounds and gardens. Cutting-edge design and Southern hospitality combine perfectly at The Brice Hotel. While the exterior is cloaked in Southern antebellum beauty, the interior is stylish, modern and sophisticated. Wed under a blanket of stars and bistro lights or at the Greene, an elegant solarium-styled space complete with a dramatic serpentine glass wall. Brides looking to maintain beautiful tradition with a modern twist should give this boutique hotel the once-over. If you’re a big fan of the Big Easy and the historical charm of the French quarter but require a bit more peace and quiet, the complete refurbishment and re-opening of the Southern Hotel (located directly across Lake Pontchartrain from New Orleans), is all kinds of exciting. This historical hotel has housed guests for over 50 years and now functions as a magnificent and historical spot for weddings. (Think Italian chandeliers in the ballroom and cocktails in the light-filled Camellia sun room flowing out to the manicured gardens.) If you’re looking for outdoor space, the courtyard has room for 160 guests. Just north of Santa Barbara, The Landsby is the ultimate venue for the beginning of your happily-ever-after. The Copenhagen Patio's charming location makes for a breathtaking backdrop for your ceremony. Afterward, host the reception in one of the banquet rooms catered with local, wine country-inspired cuisine and let your guests delight in craft cocktails from on-site restaurant Mad & Vin. The Goodland will put brides-to-be in a golden state of mind. Located just outside the downtown area of posh Santa Barbara, the beach-chic property showcases indoor and outdoor spaces that reflect the coastal culture, as well as perfectly curated, farm-driven menus and wine pairings for receptions. The Miami Beach EDITION is as sophisticated and stylish as venues come; the pool is reimagined as 1950s tropical Havana. Celebrate your wedding outdoors on the La Vista Terrace — perfect for standing receptions of 240 or seated dinners of 140, catered by the on-site Latin restaurant helmed by acclaimed chef Jean-Georges Vongerichten. Millwick is an indoor/eco-friendly outdoor venue located in the heart of downtown L.A. This unique event space resides in an 80-year-old formerly abandoned building. It now features indoor and outdoor gardens, where partygoers can mix and mingle in a gorgeous and green environment. Whether in the grand reception hall or chic courtyard, there's almost always room for more of a good time. One of the hottest venue trends of the year is re-imagined abandoned churches brought back to beautiful life. In 2015, this stunning chapel was renovated as a wedding venue by some crafty creatives with a vision. Manns is perfect for candlelit wedding ceremonies and rehearsal dinners alike. The Addison Grove in Austin is all kinds of radiant. Brides can expect 5,000 square feet of indoor-outdoor space with sliding barn walls that bring the beauty of the grove inside. The porch overlooks a pasture view of native Texas wildflowers and Longhorns. The spacious bridal house will serve as an elegant escape for the bride and bridal party. A private and manicured garden expands behind the house with towering oaks and a pond view to create a peaceful setting to prep for the big day.